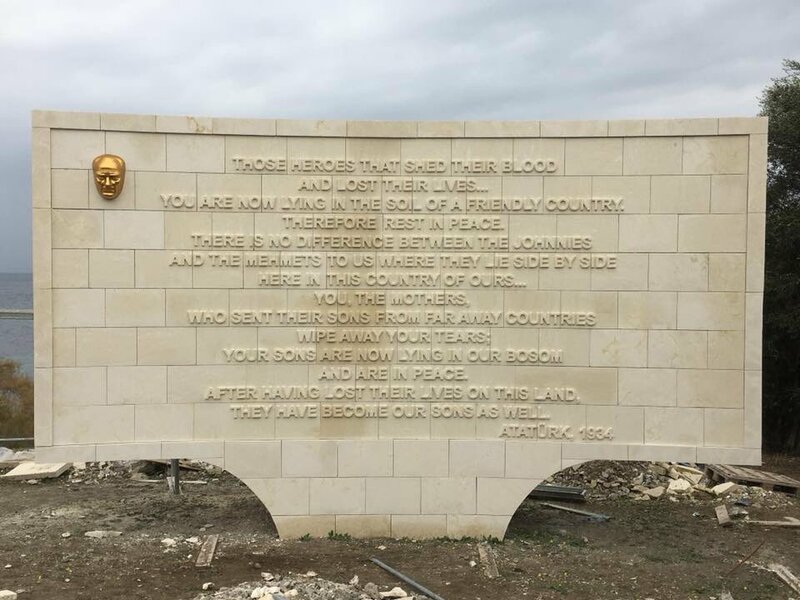 The photograph below, taken on 29 October, shows the Atatürk memorial at Anzac Cove (Ari Burnu) after recent refurbishment. Honest History offered some advice to Turkish President Erdoğan about future options for the memorial but – not surprisingly perhaps – they have not been taken up. There is no strong evidence that Atatürk ever said or wrote in Turkish the ‘Those heroes’ words that appear on the memorial in English translation. There is, however, strong evidence that the Turkish words were made up by Atatürk’s associate Şükrü Kaya in 1953 at a time of political upheaval and diplomatic manouevre in Turkey and that they have been promoted at intervals since then for similar political and diplomatic reasons. Australia and other countries have played along, partly wittingly, partly gullibly. There is evidence beyond reasonable doubt that the crucial English words equating Johnnies and Mehmets were composed by Alan J. Campbell in Brisbane in 1977-78 and accepted by the semi-official Turkish Historical Society. Even today, there is another English translation of the Kaya words which does not include this sentence. You can read the evidence about all this under our Thumbnail ‘Talking Turkey’. There is a summary in chapter 7 of The Honest History Book (‘Myth and history: The persistent “Atatürk words”‘, by David Stephens and Burçin Çakır ). There is an even shorter summary in this article in Fairfax earlier this year (‘”Johnnies and Mehmets”: Kemal Ataturk’s “quote” is an Anzac confidence trick’). Glad to see you are keeping up the good fight for clarity and honesty, HH.